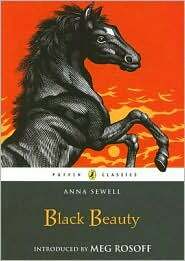 Anna Sewell’s Black Beauty was as much a part of my childhood as were ?Sesame Street? and parental concern about pesticides on apples. I decided to re-read it recently and in doing so discovered why it is, by some counts, the fifth best-selling English language book of all time. Black Beauty is the story of the eponymous horse and how he is treated by his human caretakers. Born on a farm in the English countryside, he trades hands many times, becoming a nobleman?s favorite mount, a carriage horse in London, a broken-down piece of horseflesh and finally the pet of a warm-hearted friend. Overall, it’s a gentle book. Reading it made me feel like a parent was speaking to me in a soothing voice. It?s a demonstration in favor of kindness and civility ? values that don?t seem terribly abundant in today?s children?s literature. Coming to it as an adult, I realized a few things I hadn?t picked up on as a child. First, it has a strong morality tale component. Sewell was a Quaker, so she uses characters to demonstrate the evils of drinking and roundly condemns the abuse of animals. There are also several thinly veiled instructions to child readers, such as that it is important to be good and well-mannered. And since this is a British book, the concepts of class and being ?well-bred? extend even to horses. Black Beauty is meant largely for children, so to criticize it for a few flat characters and its improbable plot would be to miss the point entirely. I?d prefer to focus on its soft and sensitive nature.